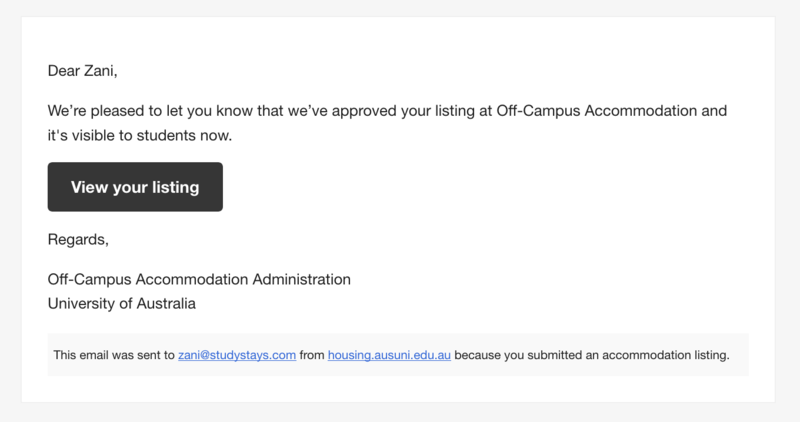 Email templates for StudyStays now support more formatting options, like bold, italic, links, lists and buttons. These templates now use the same editor used for content pages, which you may already be familiar with. There's a new option to use an email signature, which can (optionally) be applied to all outgoing emails. This saves you having to edit all your templates when your signature changes, just update it once and it will be applied automatically. Emails will now contain an additional footer in fine print, explaining clearly where the email originated and why. Nothing! All your emails have been converted for you, and any customisations you have already made will be retained. We may have replaced some default links with action buttons in places (as in the screenshot above). You might like to check your templates (Admin > Settings > Email templates) to add some formatting flair (if you fancy). And as always, if you run into any problems please get in touch at support@studystays.com.au. Here's a tip: when you're editing email templates, pressing Enter or Return will add a new paragraph with a blank line in between. If you don't want that extra blank line, you can hold Shift-Enter to end the line and keep typing on the next line.